The Los Angeles City Attorney is an elected official who serves as the city of Los Angeles' government’s lawyer and as a criminal prosecutor for misdemeanor violations. The Los Angeles County District Attorney prosecutes felonies. The city attorney is elected for four years, and the city charter requires the city attorney to be a lawyer qualified to practice in the California courts for five years preceding his or her election. In addition the General Counsel Division of the office provides legal counsel for the city and represents it in civil actions. ^ "The election took place as ordered by the council on April 6, 1868. All officials were duly elected on that date and certified on the 9th of April, three days later, but did not hold a single session. Instead, the existing administration continued to function until December 7, 1868. The April election seems to have been wholly ignored." Chronological Record of Los Angeles City Officials 1850–1938, Municipal Reference Library, March 1938, reprinted 1946. ^ Sonenshein, Raphael J. (2006). 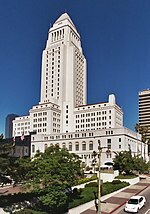 Los Angeles : structure of a city government (PDF). [Los Angeles]: League of Women Voters of Los Angeles. ISBN 0-9668991-1-3.